Well I'm working on some different looks with the Naked palette I bought. I also used my other Urban Decay Palette and Victoria Secret eyeshadows! Hopefully once I find the perfect look that I think will be awesome, then I will make a makeup tutorial. 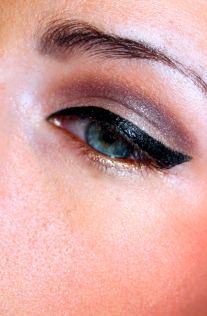 By the way I decided to upload a picture of myself how the eye makeup looks in a picture. It's okay. It could be better, but hey no one's perfect, right?